Citrus is a staple of Mediterranean cuisine, and a selection of lemon-y favorites from Italy and Tunisia comprise our sunny citrus tote. 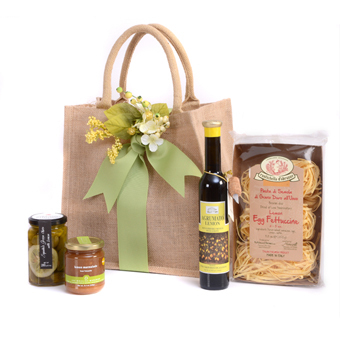 A spot-on gift for any lemon lover, the gift is anchored by a delicate Lemon Egg Fettucine from Rusthichella d'Abruzzo, crafters of fine Italian artisan pastas since the early 1900's. With a great surface for catching sauce, it is a natural for drizzling with Esperidia's Lemon Agrumato, a stunning, fragrant oil produced by the crushing of olives and lemons together. Beyond dressing pasta, the oil beautifully finishes seafood and poultry dishes, and is a standout for roasted fingerling potatoes. Casina Rossa's green snacking olives can be enjoyed straight from the jar. The addition of lemons and garlic suits them well to a variety of prepared dishes as well. Our citrus assortment is completed by an intensely flavored lemon marmalade from Tunisia's Les Moulins Mahjoub. The concentrated and beautifully fragrant fruit produces a marmalade that is subtly sweet and more fruit forward that its American counterparts, which translates in to less sugar being added. Perfect for breakfast or as an accompaniment to cheese, the marmalade is also a beautiful complement to poultry dishes. This savory gift arrives in our handsome Jute tote....a fresh, vibrant gift for the cook! Rustichella d'Abruzzo - Lemon Egg Fettucine: From Italy's premier pasta makers, a light, delicate pasta for pairing with seafood or simply drizzling with olive oil and a sprinkling of Parmesan. Esperidia - Lemon Agrumato: From Italy, an intensely flavored, fragrant olive oil, produced by the pressing of olives and whole lemons together. Ideal for finishing pasta dishes, grilled fish or poultry, fresh greens and roasted potatoes. Casina Rossa - Green Snacking Olives with Lemon: A brightly flavored, lemony olive, great for snacking, in prepared dishes and as a garnish for a martini! Les Moulins Mahjoub - Organic Lemon Marmalade: Intense, fragrant marmalade from Tunisian sun-kissed lemons. Enjoy on toast, as a pairing with cheese, or a complement to roasted poultry and grilled fish.